You can’t go wrong with the gift of a gorgeous bunch of flowers sent to the one you love this Valentine’s Day. This affection-fuelled day symbolises love, affection, gratitude and hope the world over, is one that we, at Best Buds Floral Design, especially enjoy. We’ve put together our ideas on what makes the perfect and most unique bouquets for this year’s special day of love. It might be completely traditional, but we don’t care. A simple, bountiful and beautiful bouquet of red roses symbolises all that Valentine’s Day should be. It says “I love you” in the strongest possible way, and absolutely everyone enjoys receiving this kind of timeless classic. Make an even bigger impact by adding sprigs of white baby’s breath or even white lilies to compliment the deep, rich reds of the roses. 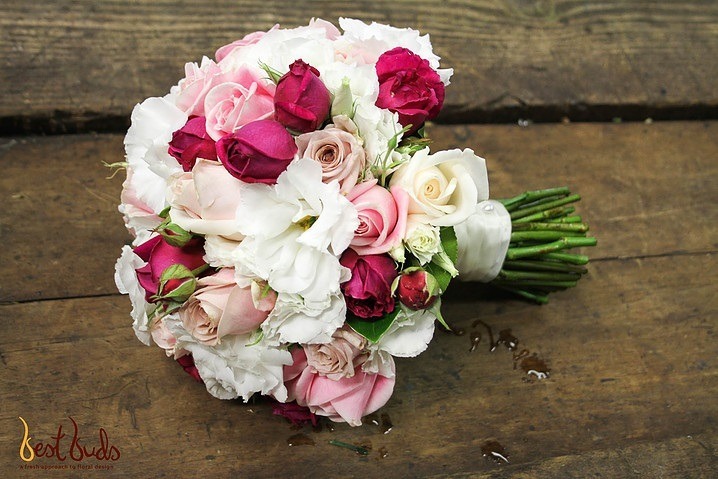 Choosing a bouquet of flowers with shades of pinks also express true love in the most beautiful way. A pink bouquet can be used to show a deep love not only for a Valentine’s lover, but can also for a mother, grandmother, daughter or close friend too. A pink posy expresses true love and devotion with heaps of beauty to boot. For added character, choose an arrangement that incorporates sprays of purples like lavender, sprigs of greenery or even splashes of whites like lilies to really complement the pink main character. A white bouquet or arrangement signifies the true essence of purity, innocence and a deep sense of love. Choose a bouquet of white roses, lilies or even daisies to brighten the heart of any Valentine this year. A white arrangement is also the perfect gift for a teacher, friend or colleague to let them know you truly love and appreciate them. If opting for the non-traditional is more your style, then choosing a bouquet with an array of brightly coloured flowers might be more to your liking. A bright bouquet of oranges, yellows, cerise and blues will bring joy and an abundance of love to any recipient’s heart. Gerbera daisies, tulips and sunflowers are all brilliant colourful floral choices for this kind of multi-coloured arrangement. It will signify your love in the quirkiest and most modern way possible. No matter what your preference, or that of the one you love, there are many ways to create unique, personalised Valentine’s Day bouquets that will make the day this year a truly memorable one. For more love-filled bouquets, contact Best Buds Floral Design today. Keep your eyes peeled on our Facebook and Instagram accounts for more love-inspired ideas.